Today, I’m excited to feature very special pottery from Huue Craft Store. It was a pleasant surprise when I received an email from Mr. Choi, at Huue Craft, about sponsoring my blog with this beautiful tableware from Korea. I’ve always been interested in hand-made pottery, and often check out pottery showcases whenever I go to Korea. Unfortunately, they are hard to bring over on the airplane. Huue Craft Store is an online store dedicated to the finest Korean pottery tableware. Their work is renowned for its “understated elegance”. They don’t scream for attention or try to be trendy, but rather offer pleasing simplicity and timeless beauty in form and texture. All works are one-of-a-kind pieces, elaborately handcrafted by their five prominent potters from Korea. They ship worldwide to over 25 countries, via fast and low cost shipping, so please check them out at the Huue Craft Online Store. Now, let’s talk about today’s recipe. 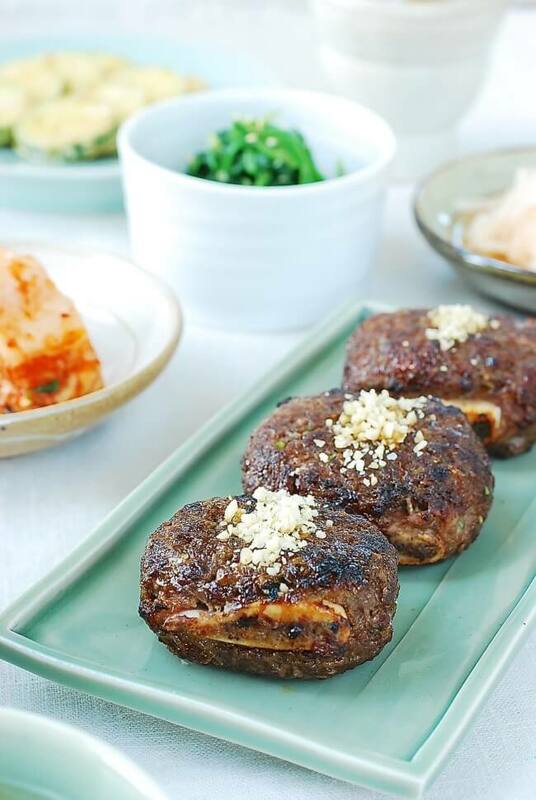 These fancy beef patties are called tteokgalbi (떡갈비), literally translated to rice cake ribs. Don’t expect any rice cakes (tteok, 떡) in the dish. 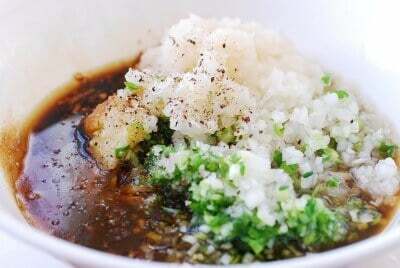 The name comes from the way the minced meat is kneaded and shaped as rice cakes are made in Korea. 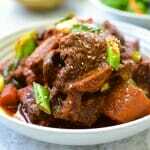 This dish hails from the royal court where the cooks minced the rib meat, for the King, for easy eating. Tteokgalbi later became a regional specialty of South Jeolla Province (전라남도). Nowadays, it’s popular all over the country. Every full course meal (hanjeongsik, 한정식) I had in Korea last year included a version of tteokgalbi, and there are many restaurants specializing in tteokgalbi all over Korea. 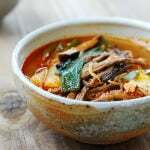 Tteokgalbi is made with ground beef short ribs. The meat is separated from the bones, finely minced, and then marinated. 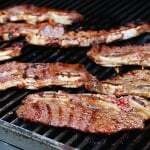 Traditionally, the marinated meat is attached back to the rib bones before being cooked. 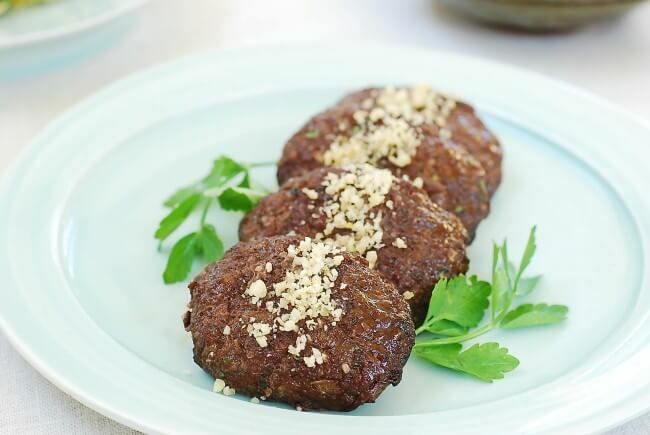 This not only gives the patties their identity of being short rib meat, but also adds a little extra flavor to the meat, but you can simply shape them like burger patties if you like. 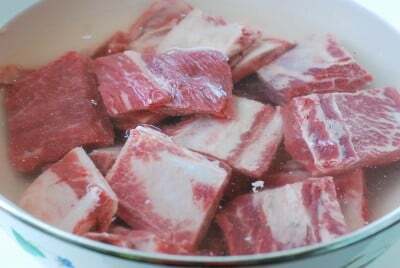 Beef short ribs are an expensive cut of meat, so you can substitute with beef chuck and/or brisket. The meat is traditionally hand-minced, but it’s a demanding job. If you don’t want to bother, use a meat grinder (or food processor) or ask your butcher to grind them for you. 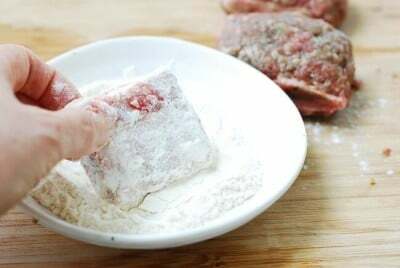 It will help if you slightly freeze the meat in small pieces before you use a meat grinder or food processor. You can also use high quality ground beef. 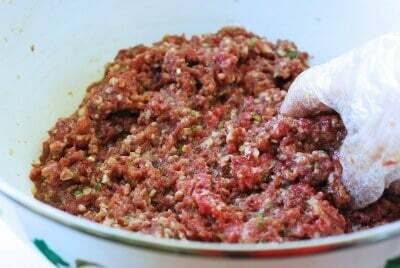 It’s now very common in Korea to use ground beef (or pork, or a combination) to make tteokgalbi. 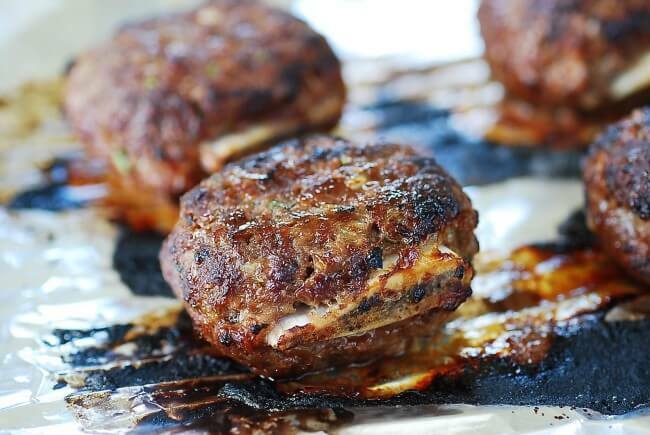 These tasty, tender patties can be broiled, grilled or pan-fried. They will be excellent for your outdoor cooking this summer as well! Trim excess fat. 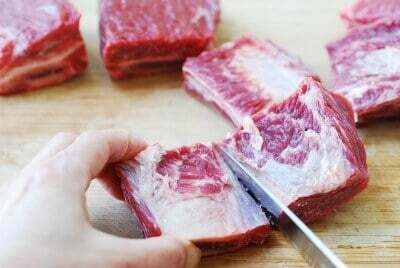 Remove the meat as much as possible from the bones. Keep the meat in the freezer for about an hour. 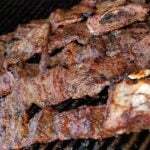 Soak the ribs in cold water for 20 to 30 minutes to remove some blood. Drain. 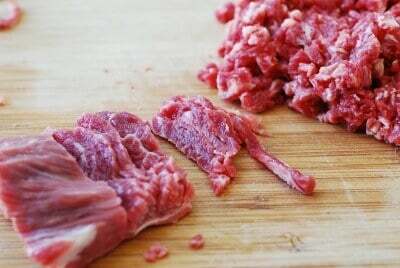 Grind the meat using a meat grinder or a food processor. 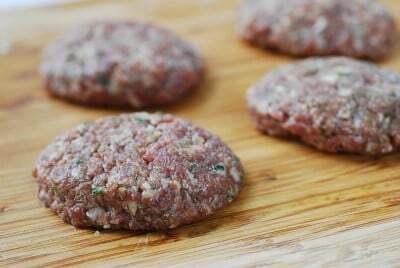 If mincing by hand, thinly slice the meat, cut the slices into thin strips, and then cut crosswise into small pieces. 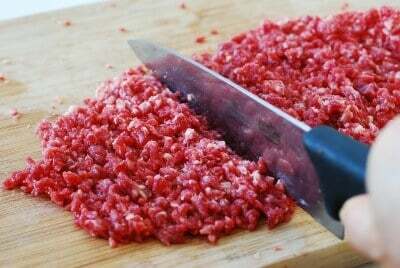 Mince the meat by rocking the blade back and forth into the smallest pieces. Mix all marinade ingredients well. Add the marinade to the meat, and then mix very well. Knead the meat until it becomes a bit sticky, 2 to 3 minutes. Marinate the meat for at least 2 hours (overnight for best results). 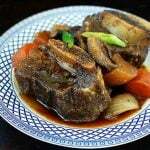 If using the rib bones, dredge the bone in flour. Attach the meat to the bone in even thickness as you’re wrapping the bone with the meat. 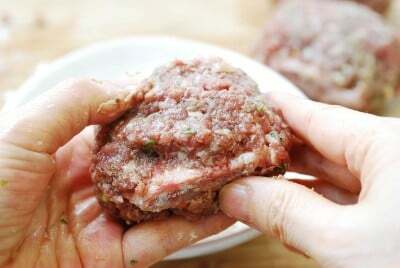 Press with your palms so the meat is tightly attached to the meat. Otherwise, you can simply make round or oval patties. Set the oven to broil and preheat. 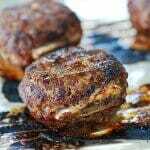 Lay the meat in a broil pan and place it on the top rack of the oven, usually about 6 inches below the broiler. Cook for 4 to 5 minutes. Carefully flip them over and cook for an additional 3 -4 minutes until nicely charred. You can also grill over a charcoal or gas grill. Grill over medium to medium high, turning only once, 2 – 3 minutes on each side. No problem! As I said in the post, it’s pretty common these days to use ground beef. Enjoy! 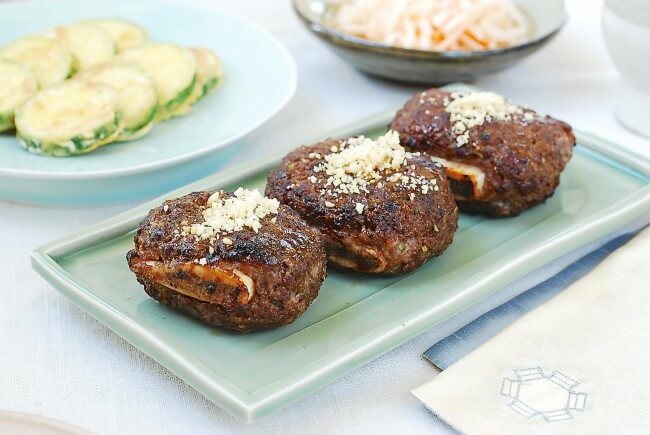 Galbi burger? I really like that name. Mmm your menu sounds great! Enjoy! Thanks for coming by! Never heard of tteokgalbi before… but they sure look delicious! Thank you! It’s hugely popular in Korea, but not so much in the U.S. Hope you try it one day. 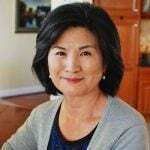 Hi Hyoson – I learn so much from you! I’ve never heard of tteokgalbi before. And I was confused when I first saw the name. I thought, hmmm, maybe I really didn’t know what tteok meant. 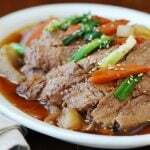 Love this recipe, I will definitely make with the bone in! Can’t wait to visit Huue Craft too. Ha ha. Yes, the name clearly is deceiving. And thank you, Lori, for such kind words! Also, I’m curious what did you garnish the patties with? Chopped pine nuts. Oops, I need to add that to the ingredient list. Thank you for reminding me! Wow, those ribs look like they are packed full of flavours! You’ve minced the meat so perfectly. 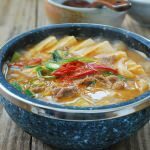 I’m keen to try this though I’ll probably take the cheat’s way and use minced beef 🙂 Your photos look fantastic by the way! Wow, those dishes are gorgeous!!!! Hi Hyosun! This looks so delicious! Could you please tell me how much ground beef i would need for this amount of marinade?